Netflix is the epitome of procrastination when I am away at school. I feel like all college students get drug into watching episode after episode in order to avoid getting ahead on school work. Now that I am home for summer there is no need to feel embarrassed about how many episodes I can watch in one sitting (the automatic play feature is really dangerous to productivity). 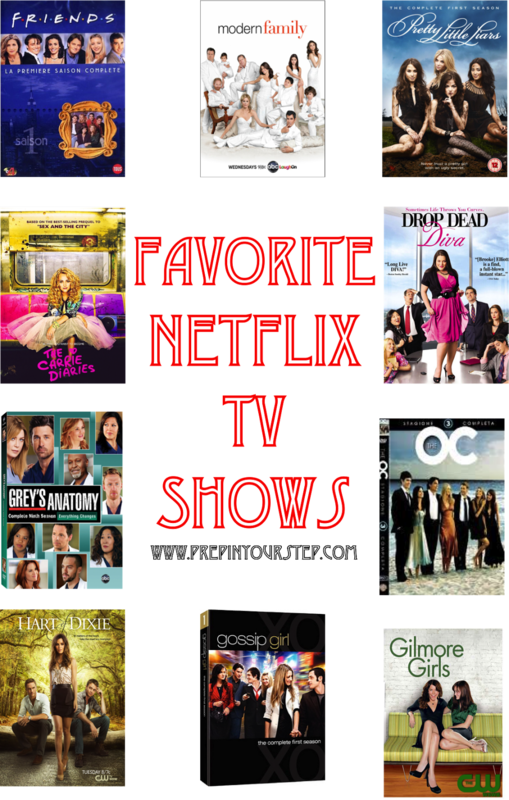 In case you are in the same boat and looking to get completely absorbed in some sort of television show this summer I am sharing my Netflix favorites with y'all and hope that y'all will leave your recommendations for me as well! My Favorites: Friends, Gilmore Girls, Hart of Dixie, Gossip Girl, The Carrie Diaries, Greys Anatomy, Pretty Little Liars, Drop Dead Diva, Modern Family, The OC (sadly not on Netflix but I had to include it anyway)! I haven't actually watched Greys Anatomy but it is on my to-watch list since everyone who does watch it seems to be all about it. With multiple seasons up for each of these shows this will definitely beat any summer bordom you may be trying to combat since according to Eloise "Being bored is not an option." Carrie Diaries is my all time favorite Netflix show! If you've never seen Orange is the New Black you should check that out too! I'll have to try Hart of Dixie & The Carrie Diaries! Also One Tree Hill is a must! I loved the Carrie Diaries, so sad it got cancelled. Friends is one of my favorite shows!! Grey's Anatomy, Gilmore Girls, and Hart of Dixie have all been binge watched this past semester! So great! great picks! some of my other favorites are the office and the vampire diaries.. it's amazing how quickly i watched both of those! I LOVED The Carrie Diaries! Parks and Recreation is really good too! Amy Poehler can't be beat. I'm anxiously waiting for the day Netflix puts The OC on instant play! I actually prefer to watch Hulu Plus over Netflix. Some of my favs include Make It or Break It, and Melissa and Joey! Get best relocation service provider at Dealkare.